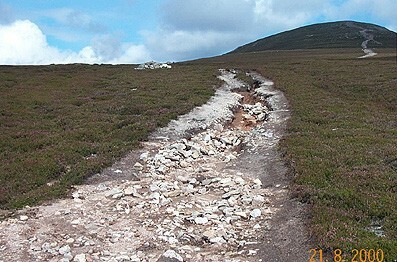 There is no doubt that the growing popularity of Scotland’s mountains is resulting in a rapid deterioration of many mountain footpaths.�� Now that UDAT has upgraded the car and bus parking at the Spittal at Glen Muick, see Mountain Views Autumn 2000, it has turning its attention to addressing the problems of footpath deterioration in the UDAT area.�� For the interest of new readers UDAT is the Upper Deeside Access Trust which is both a limited company and a Scottish charity and whose partners are Aberdeenshire Council, Balmoral Estates, Cairngorm Partnership, Grampian Enterprise and Scottish Natural Heritage. 6 of the paths selected are in the Lochnagar area. The results of this survey were printed in February 2001, in 5 Volumes entitled respectively: Survey Findings; Path Assessments; Photo-record; Field Data and Priorities for Path Management.� The Survey therefore investigated the Path Characteristics which include the length, accessibility, gradient, surface, vegetation, braiding, width and depth as well as the Path Condition which covers the roughness, drainage, erosion, dynamism (stability – affected by visitor numbers) and condition. In all 45km was surveyed and the estimated cost of completing the pre-scribed work is noted as just under £800,000 minimum and just over £ 1million maximum.� The Survey used standardised Path Industries Skill Group (PISG) methods. On 27th October UDAT hosted a Workshop in the Invercauld Arms, Braemar to consider the survey’s findings. The turn out was good and a lot of different factions were represented. Alistair Beeley, NEMT's Secretary and myself, this time representing Mountaineering Council for Scotland also attended.� It was made clear from the outset that UDAT meant business and delegates were being asked to actively participate in the on-going work programme.� UDAT wanted to channel our collective knowledge and experience to compliment the findings of their survey and so assist them prioritise the work required on these 16 paths. After some introductory talks we were soon split up into 4 workgroups which each concentrated on 4 paths to pool our knowledge on the individual Path Conditions, Nature Conservation Values, Landscape Impacts, Recreational Value, Potential Deterioration and Appropriate Solutions of our allotted paths.��Such alternatives as going for broke with the badly eroded paths against getting in now with pre-emptive work to halt the destruction of paths just at the brink of deterioration were discussed.� It was accepted from the outset that UDAT's work was developing in parallel with the pending introduction of the Cairngorms National Park and would dovetail with the latter as it developed.� The meeting surprisingly did not spend much time on considering how the £1 million funding was going to be raised so it appears that the fund-raisers are doing an excellent job. BUT there are big issues at stake here.�� Whilst mountain path deterioration does need to be addressed it is essential the necessary work is done sensitively so we do not end up “urbanising” the mountains.�� Our last 2 issues of Mountain Views contain articles by Dougie Baird on the footpath work he is involved with at Mar Lodge and Glen Coe and his reports describe how this work can be done carefully to minimise impact. The other issue is the concept of remoteness – the wild land issues.�� In today’s society the need to get away from it all has never been greater – the Cairngorms National Park with UDAT as one of its forerunners – has a world-class asset in these mountains.�� (Can I recommend to you the lyrics of the new found Song for the Mountains).� Right now, with proper use of the Zoning Principle, and the careful sourcing and use of funds, we can accommodate the needs of most of our visitors.�� Some fine words were spoken at the UDAT meeting and some great groundwork has already been done.�� Path construction and repair is an old skill finding its way to the top of today’s agenda.�� New employment opportunities are now on the horizon.�� It is critical that UDAT, as a unique and very progressive organisation, that is breaking new ground on a daily basis, maintains its professional and sensitive approach for the work it is about to undertake.� At all costs, whilst we do respect and support UDAT’s work, we must guard against letting them get seduced by a cheap close out to full-fill their lengthy shopping list.